I used to drive through this five points area every time I drove into Middletown. The crazy angles of the buildings and the electrical wires always got my interest. It reminded me of old towns that Robert Crumb would draw. I stopped one day to photograph it, and I had to stand in the middle of the street to capture the angle I wanted. Everyone was looking at me funny. I'm used to that, so I didn't think anything of of it. 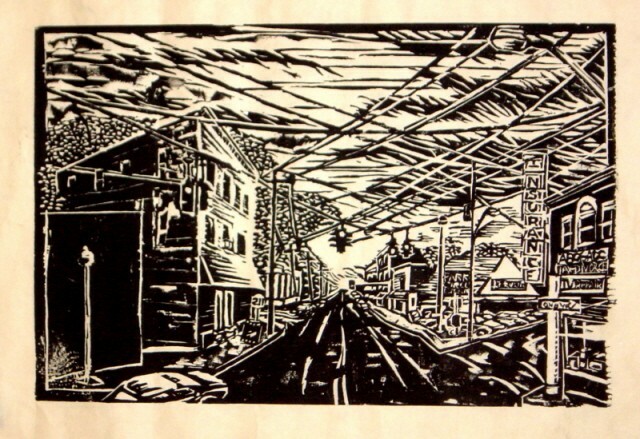 When I finished the woodcut and showed it to friends upstate, they said, "Why on earth would you want to do a woodcut of that intersection- that's the drug dealer's corner" No wonder they were looking at me suspiciously.